iCloud is one of the best cloud services offered by Apple. 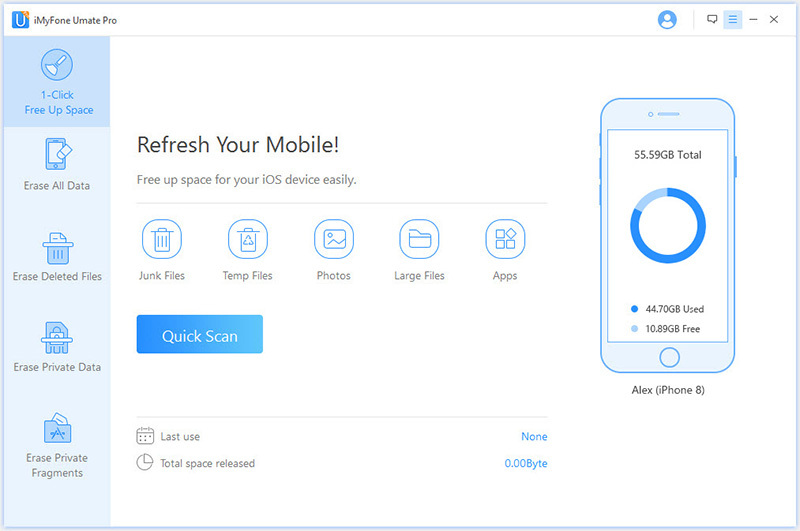 This service will allow you to backup all your iOS data. Coming to your photos, iCloud will allow you to view them from anywhere and from any device. All you need is your Apple ID and a stable internet connection. Maybe you don’t know how to access iCloud photos on iPhone, Mac, or Windows PC. You shouldn’t worry though. This article will change that. 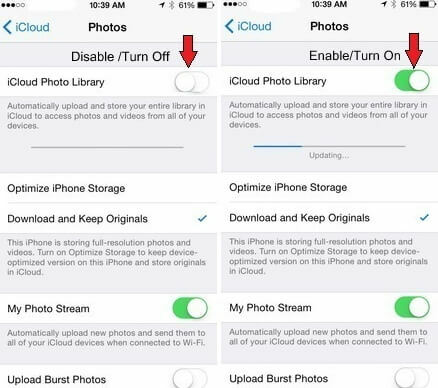 1: How to Access iCloud Photos on iPhone? 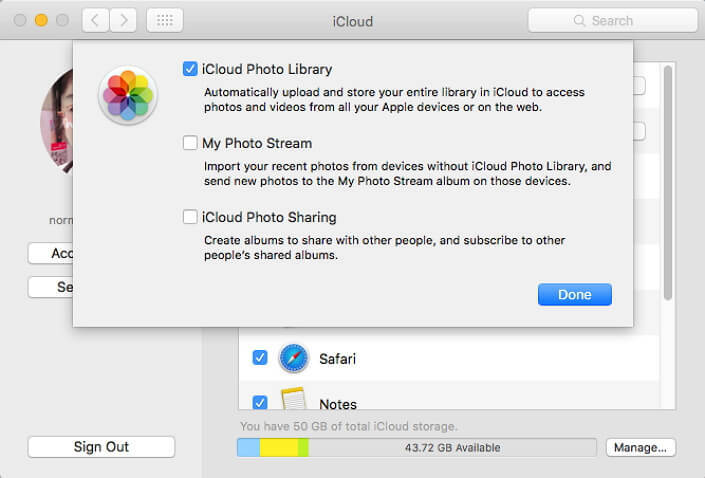 2: How to Access iCloud Photos on Mac? 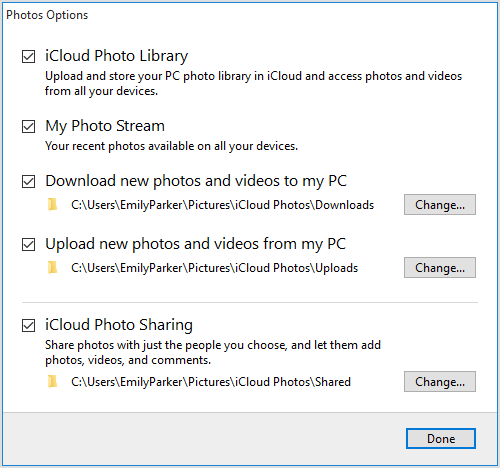 3: How to Access iCloud Photos on Windows PC? Step 1: Launch Settings and tap iCloud. Step 2: Use your Apple ID and Password to log in if you are not already logged in. Step 3: Click Photos, tap the iCloud Photo Library switch to toggle it on. Step 4: Go back to the home screen and click Photos app to launch it. Tap Albums. If Wi-Fi is on, your iCloud Photos should be available in your albums. How to Access iCloud Photos on Mac? Step 1: Open the Apple Menu and then select the System Preferences. Under the System Preferences, select iCloud. Step 2: Use your Apple ID and Password to sign in. Activate the Photos option under iCloud by ticking the checkbox next to it. Step 3: Click the Options button next to Photos. Activate both the iCloud Photo Library and My Photo Stream. Click Done. As long as the computer is connected to the internet and it has enough space, your iCloud photos should be downloaded to the computer where you can access them easily. How to Access iCloud Photos on Windows PC? Step 1: Install iCloud for Windows on your PC. Launch the tool and use your Apple ID and password to sign in. Step 2: Next to Photos, tap Options. In the window that opens, select iCloud Photo Library and My Photo Stream. Click Done. As long as you are already connected to the internet and the Windows PC does have enough storage space, your iCloud Photos should sync to your computer where you can check them out. Save Space: back up the photos to your computer or compress them to save space. Safeguard Privacy: erase your private photos from your iPhone with a 0% chance of their recovery. 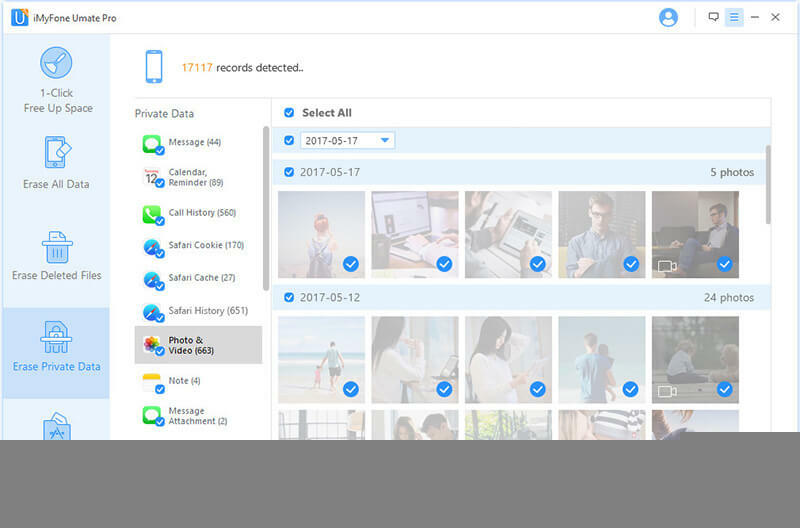 Erase Deleted Photos: locate and erase the photos deleted by conventional method. iMyFone Umate Pro is capable of erasing more than just your Photos. 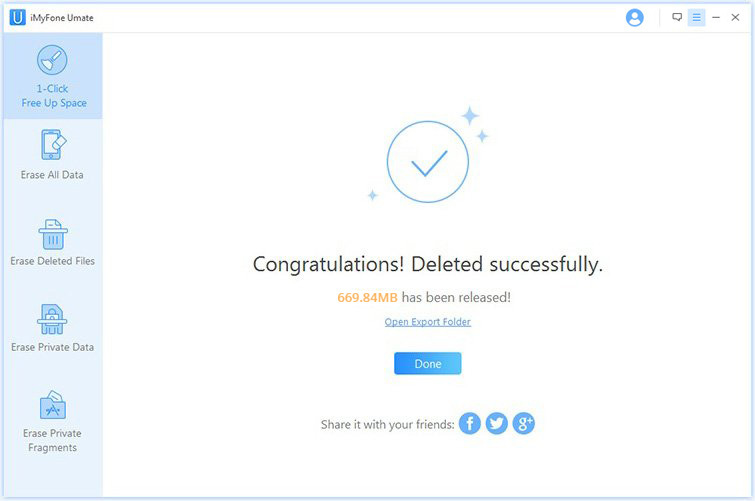 It can erase other data such as videos, messages, contacts, call history, browsing history, and data generated by third-party applications such as WhatsApp, Kik, Line, and Viber. Before erasing your data, you get to preview it so that you can erase it selectively. Step 1. Download, install and open iMyFone Umate Pro on your computer. Step 2. Connect your iPhone to computer and Select Photos tab under the 1-Click Free Up Space function. It will show you how much space you can save for your iPhone by compressing/backing up/deleting photos. 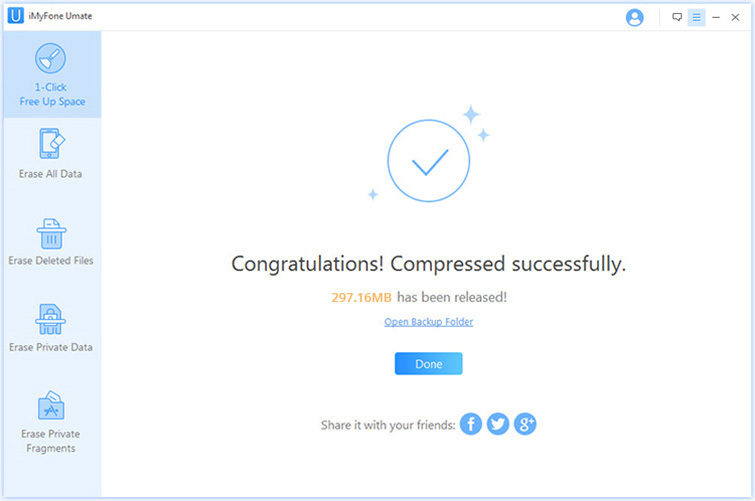 The Backup & Compress option can save you up to 75% of your camera space. After selecting this option, all your photos will be backed up to your computer. 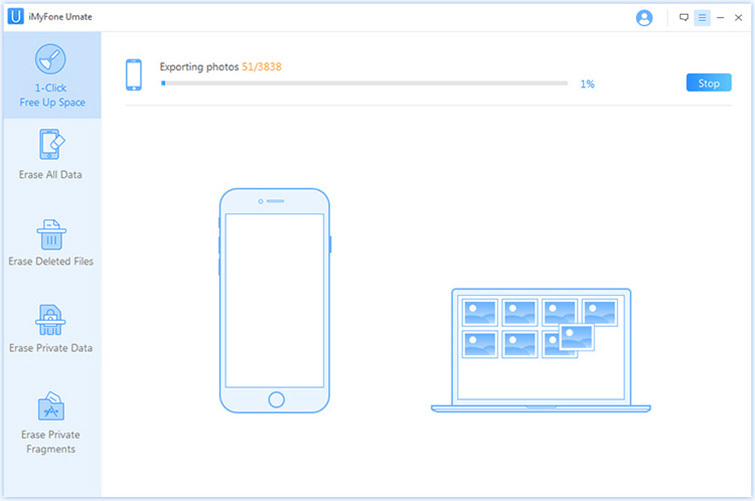 Then it will compress the photos, this process can free up to 75% of your iOS storage space. This option will export your photos to PC and delete them from your iOS device. 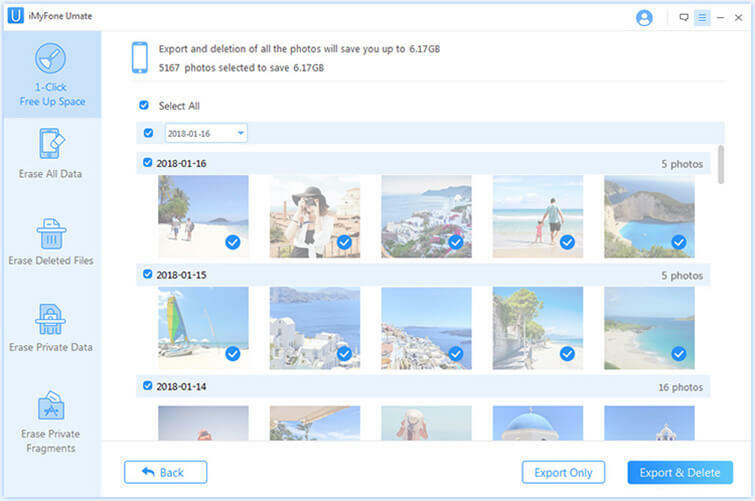 First, you need to select the unwanted photos, then click on Export & Delete, if you only want to backup your photos, you can click "Export Only". After the process finished, you will see how much storage has been saved. Do you worry that your private photos or other personal information on your mobile devices may be revealed to others? iMyFone Umate Pro will delete all of this residual information completely and permanently. It can make sure the private photos will be rendered unrecoverable.